After much speculation, it turned out that no one wanted to buy the struggling social network. Shares of social network Twitter (NYSE:TWTR) tumbled 22.1% in October, according to data provided by S&P Global Market Intelligence. Reports that multiple companies were considering an acquisition of Twitter in late September pushed the stock up, but those gains were reversed in October after the sale process fell apart. Twitter has struggled to turn its 300 million users into a profitable business. The company has never made a profit, and while rapid revenue growth kept investors happy for a while, signs of trouble caused the stock to crash over the past couple of years. In late September, Twitter reportedly hired Goldman Sachs to advise it on a sale, causing the stock to soar. Companies that were reportedly interested in Twitter included Salesforce.com, Microsoft, Disney, Alphabet, Apple, and AT&T. Rumors kept the stock elevated until it became clear in early October that no bid for Twitter was forthcoming. The stock tanked as a result. Twitter stock made up some ground in late October after the company reported third-quarter results that were above analyst expectations. The company announced a restructuring effort, which included a 9% workforce reduction. Twitter's strategy going forward will be to refine the core service and improve safety in an effort to reignite growth. Live-streaming video will also be a major component, with Twitter signing deals bringing content to its platform. There are two main problems with Twitter that prevented the company from being acquired. First, even after the stock dropped in October, Twitter's valuation is optimistic. The company is currently valued at about $13 billion, putting the market capitalization at more than five times trailing-12-month sales. For a company with a stagnating user base and GAAP losses measured in the hundreds of millions of dollars, that's a steep price to pay. Second, Twitter has a major problem with hate speech and vitriol. Disney reportedly lost interest in Twitter due, at least in part, to the hate speech permeating the platform. These problems drive existing users away and make new users less likely to stick around, and the election this year has only made the situation worse. 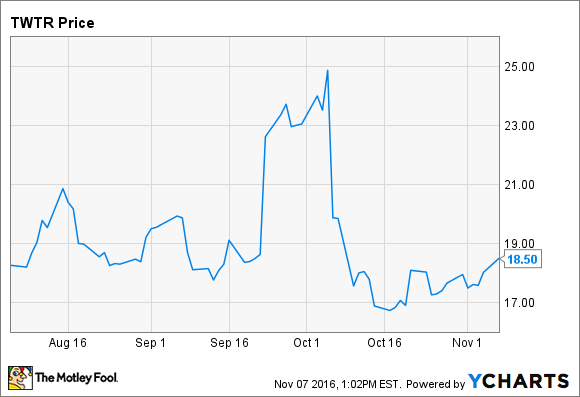 With the prospect of an acquisition dead, at least for the time being, Twitter stock fell back to earth in October. Cost cuts are a positive step, but the company ultimately needs to drive user growth in order to have any chance at reaching profitability in the foreseeable future. If Twitter can moderate its losses and clean up its platform, an acquisition in the future might be in the cards. If not, the stock could drop a whole lot further.